Please note: The interactive version of the project has been designed for at least table touch devices or desktop computers. This limitied screen size only presents a preview of the complete, interactive version. Does this agreement include substantive provisions stipulating the liberalization of trade in services? Does the agreement contain a reference to the General Agreement on Trade in Services (GATS)? Does the service chapter contain an MFN clause? Does the service chapter contain a national treatment clause? Does the service chapter grant the right of non-establishment (that is, does it allow the provision of services without local presence)? Does the service chapter allow the movement of natural persons in the provision of services? Does the service chapter include a review provision? Does the agreement contain substantive provisions on public procurement? Does the agreement guarantee national treatment with respect to public procurement? Does the chapter on public procurement include a transparency provision? To which entities/at which level of government do the substantive procurement provisions apply? What is the scope of the public procurement provisions in the agreement? Does the agreement contain a reference to the WTO/GATT procurement agreements? Does this agreement include provisions for solving disputes? Is there a provision on consultation? Is there a provision on mediation? Is there a provision on arbitration? Is there a provision on the creation of a standing body with delegated powers? Is there a reference to external DS institutions? Is there a provision on the choice of DS fora? Does the ultimate option for forum choice foresee the complainant to choose the forum? Does the ultimate option for forum choice foresee the parties to chose the forum jointly? Are there restrictions/limits to the use of multiple fora? Is there a provision on bindingness? Is it explicitly mentioned that provisions on DS are binding? Is it explicitly mentioned that provisions on DS are NOT binding? Are there any provisions related to retaliation in case of non-implementation? Do both parties select jointly the appropriate level of retaliation/compensation/sanctions? Does the complainant select the appropriate level of retaliation/compensation/sanctions? Is there an order in the process of selecting appropriate levels of retaliation/compensation/sanctions? Are there provisions on retaliation in the same sector? Is cross-retaliation possible (sanctions in other sector)? Are monetary sanctions (compensation) possible? Are there any exemptions from DS? Is there an explicit positive list of areas covered under the DSM of the PTA? Is there an explicit negative list of exemptions from DS? Does the treaty list time frames related to stages and implementation of dispute settlement decisions? Does the panel issue an initial/draft/interim report prior to the issuance of the final report? What is the ultimate procedure by means of which the chairman of the arbitral panel is selected? The chairman is selected by consultation of parties. What is the ultimate procedure by means of which the chairman of the arbitral panel is selected? The chairman is selected by arbitrators jointly. What is the ultimate procedure by means of which the chairman of the arbitral panel is selected? The chairman is selected by lot. What is the ultimate procedure by means of which the chairman of the arbitral panel is selected? The chairman is selected a third party (e.g. WTO DG ). Does the process allow for separate opinions to be included in the panel report? How many times do parties evoke the concept of “mutually agreeable solution” (MAS) throughout the text of the DS chapter until the award is out? How many times do parties evoke the concept of MAS throughout the text of the DS chapter post award? In the 1960s and 70s, Western Europe deepened its economic ties agains the Soviet bloc. As a result, the European Community was created by the "EC Treaty" (1957) upon the later formation of the European Union. Third world countries embraced free trade to be less dependent on the Western and Soviet bloc. New blocs were developed in Africa (1962), Asia (1964) and North America (1968). With decolonization on the way and high hopes for a “New International Economic Order” Third World countries rebalanced trade relations with Developed countries. For instance, the Region-Region Agreement "Lomé Convention" (1975). The fall of the iron curtain created demand for PTAs. In the Americas, countries started to sign PTAs in the wake of the creation of the North American Free Trade Agreement (NAFTA) in 1992. Up to the early 1990s, European countries were by far the most avid signers of PTAs. By 2002, countries such as China and Japan had not yet signed a PTA but most recently, Asian countries, such as Singapore or China, have become prominent actors in the spread of PTAs. Early agreements were mostly of a plurilateral type (more than two but not many member countries). Recent PTAs are increasingly Region-Region Agreements and not yet captured are the ongoing negotiations for "mega-regionals", namely, the TTIP and the TPP. 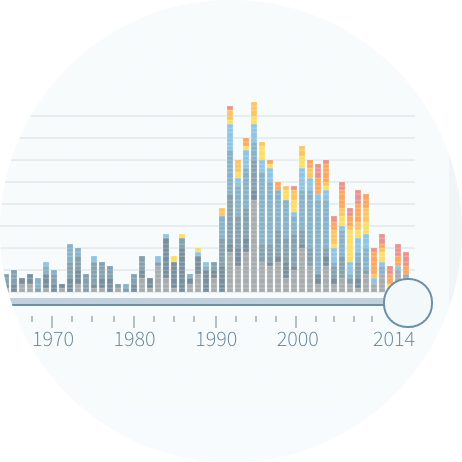 This radial dendrogram distills more than 700 trade agreements that have been signed between 1947 and 2014. 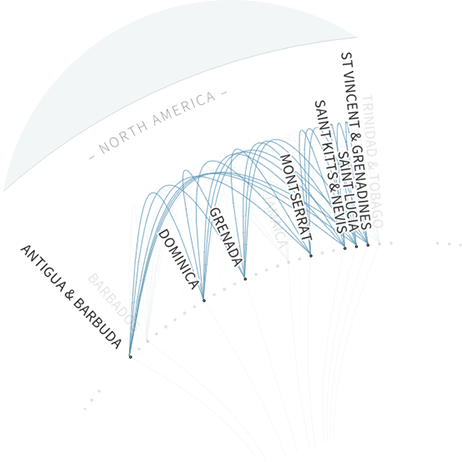 The data is freely available at designoftradeagreements.org and was collected by an international team of researchers. It was originally published in: Dür, A., Baccini L., and Elsig M. 2014. 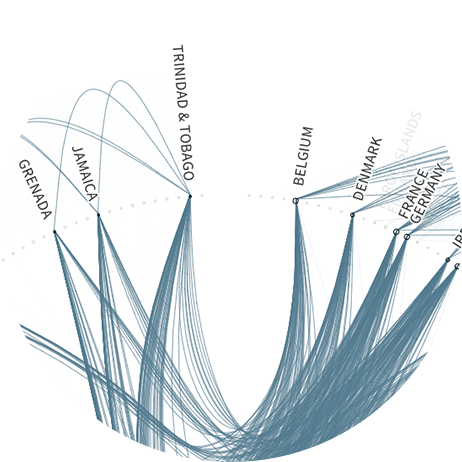 The Design of International Trade Agreements: Introducing a New Dataset. The Review of International Organizations. 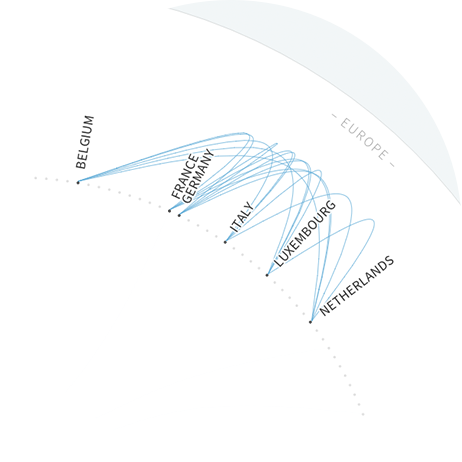 The generic term for all trade agreements shown in the visualization is “preferential trade agreement” (or PTA), following Dür and Elsig (2014). A PTA is defined as an agreement that liberalizes trade between two or more countries but that does not extend to all or at least a majority of countries. The PTAs shown here encompass partial free trade agreements, full free trade agreements and customs unions. The depth index is a simple additive index of 7 key statements that can be part of a PTA. The 7 key statements are tariff reduction, intellectual property rights protection, government purchases, technical barriers to trade, services, investments and compe-tition. The scale of the index is 0 – 7. The depth measure used here was developed by Dür, Baccini, and Elsig (2014). The depth of PTAs is heterogeneous. Some PTAs cover a large number of different issues, from trade in services to government purchases, whereas others are very narrow. Some PTAs include far-reaching statements, while others are relatively shallow. For example, a PTA with a depth score of 0 is an agreement with no substantive statements in any of the 7 key statements. On the other extreme, a PTA with a depth score of 7 is more than an agreement with substantive statements in all 7 key statements. Further details on the index are provided in Table 1. Note that the depth index is not available (N.A.) for all PTAs because the researchers did not find full texts for all agreements. The Bertelsmann Foundation launched the Global Economic Dynamics Project to help make complex economic dynamics trans-parent and understandable. The project examines the causes and effects of economic trends, as well as the connec-tions linking one trend to another. Within the GED Project we are working with latest tools and methods for measuring, forecasting and representing global economic dynamics. 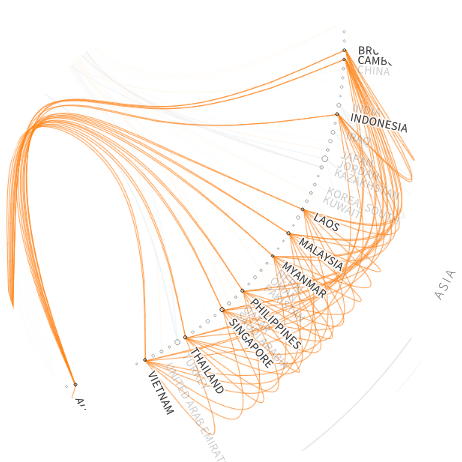 One example is our award-winning visual-ization tool GED VIZ that makes global dynamics of trade, finance and migration flows tangible. The above visualization of trade agreements is a consequent addition to the GED Project and was initiated by the project team. 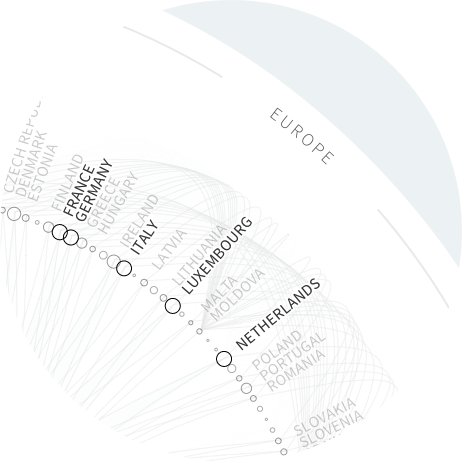 The visualization was designed and imple-mented by Sebastian Sadowski. Dr. Tobias Pfaff helped with bridging the economic and data perspectives.